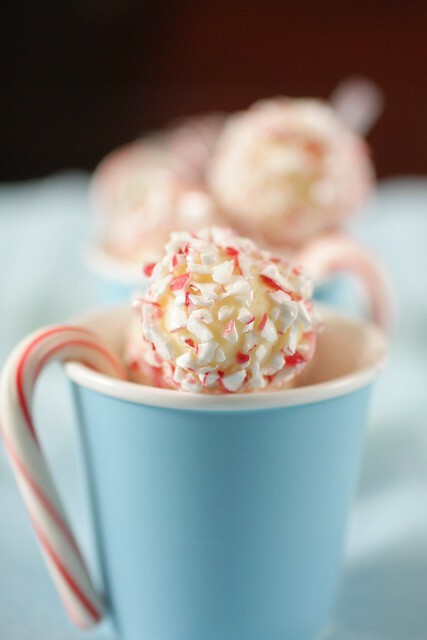 By now, you may have caught on that I like the combination of peppermint and chocolate (any kind). This recipe is no exception. The thing is, when it comes to truffles, white chocolate is a little trickier to deal with, because it’s so soft to begin with. I went through a few failed batches of truffles before I settled upon the magical combination that worked for me. Perhaps the biggest surprise, for me, is how much my mom enjoys these little confections. Hmm. Perhaps that’s really where I get my love for white chocolate and peppermint? I did once have her try the white peppermint mocha from Starbucks…my mom, the coffee purist…really, really liked it. Then again, how can anyone not? Again, it has to be said, if you can find a bag of precrushed peppermints, it’s worth it. You’re not sacrificing any taste, and you’re saving a lot of time and headaches (literally on the headache front – if you’ve whirled candy canes in a food processor, you know what I mean). Heat cream and corn syrup in a heat proof bowl over simmering water. 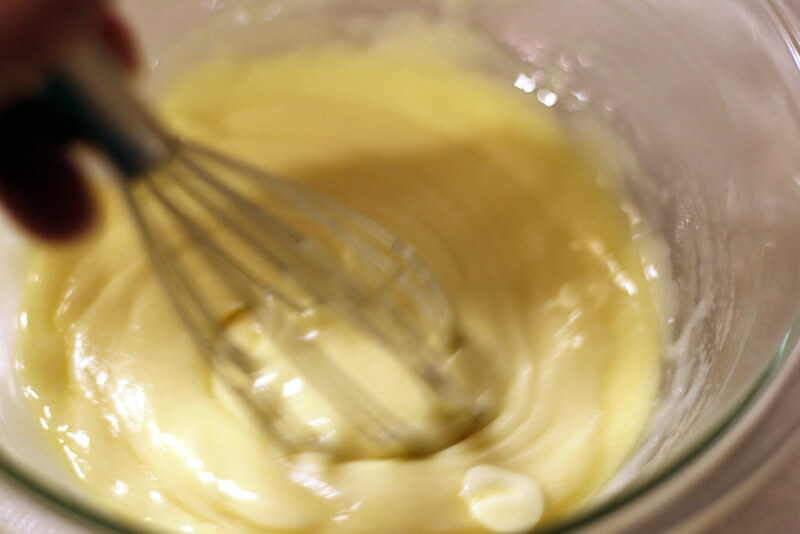 Add chocolate, a little at a time, whisking to combine. Put the candy canes in a plastic baggie and whack them with a kitchen mallet until they are crushed. Or go the super-easy route and use purchased crushed peppermints. Place in a small Pyrex dish or a ramekin. Line a baking sheet with parchment. Using a melon baller or spoon, scoop small balls of ganache and roll in your hands to slightly warm the truffle. Dip in the crushed candy mixture and place on the baking sheet. Refrigerate until firm, about two hours. Store in a covered container in the refrigerator up to one week. Remove 30-60 minutes before serving. You can also freeze truffles for up to one month. 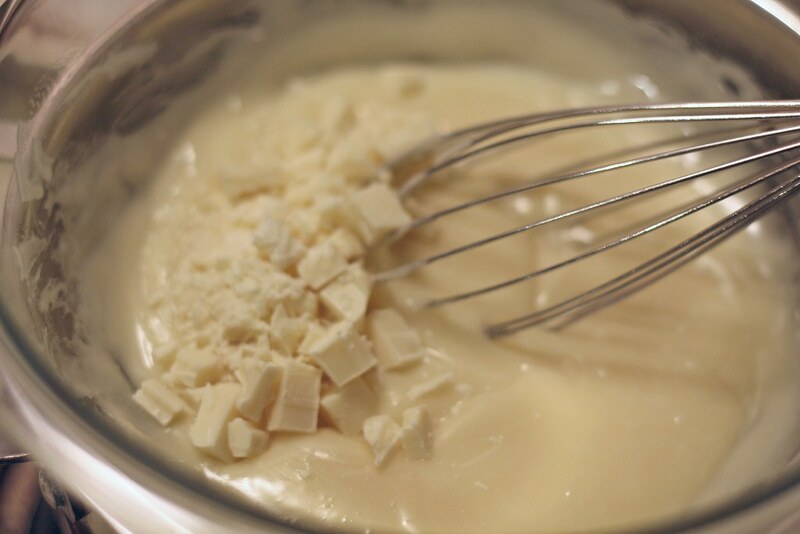 White chocolate ganaches are definitely tricky – for semi-sweet or bittersweet ganaches, the standby 1:1 ratio of chocolate and cream is golden, but it’s more like 3:1 for white chocolate – which means you can’t douse the chocolate in heated cream to melt it, and instead have to watch it very carefully while you melt it. It’s worth it, though, since it can take on so many flavors. Last weekend, I did mango white chocolate ganache :). Yeah, I can probably make dark chocolate truffles with my eyes closed. You’re right – white chocolate is a little more finicky, but imagine how happy I was when I finally found the ratio that worked! The mango white chocolate sounds really, really good. Your truffles looks so beautiful! I was wondering where you got those yellow and blue cups you placed the truffles in? I have a few that I bought in Paris and was wondering where I can find them here in the States. Thanks and Happy Holidays. These sound SO GOOD! I’ve bookmarked them for next year’s baking/candy making adventures. Cute truffles! I’m not a big fan of candy canes, but they make things look so pretty! Amazing! They look sooooo good and pretty. Can ANY truffles be stored at room temp.? I had planned to make some and give as gifts, but it seems odd to give someone a gift that must stay in the fridge because it is so delicate. Maybe just odd to ME, but whatever. I should warn you that when I ordered mine, they did eventually arrive but were quite delayed, with no response/explanation from the company. 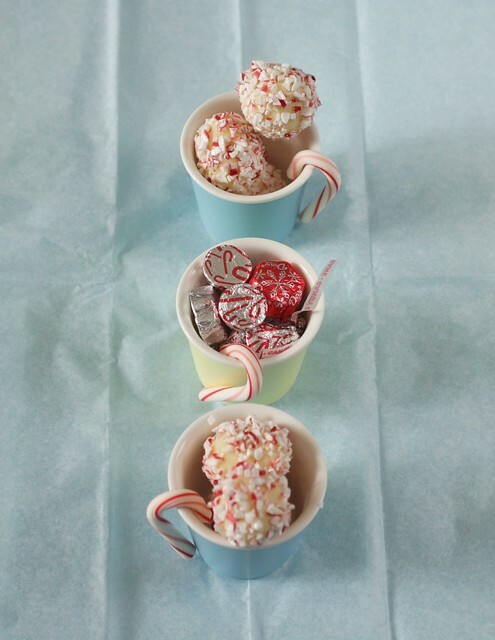 @Beth: my dark chocolate truffles can be stored at 65*F, but I would not do that with the peppermint white chocolate – the white chocolate is simply too soft, and the candy canes will start to get soft at a warmer temperature. When I give them away, I use tall plastic cookie/candy bags, because those are easy to refrigerate. So pretty! I love peppermint, especially this time of the year! Hey Sara, about how many truffles does this recipe make? Also have you ever mixed the candy into the ganache? Can you melt the white chocolate in the microwave?